Join us for a gallery talk by the artist and reception in Ringel Gallery. 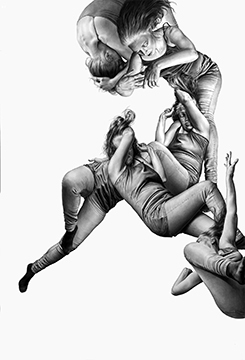 The bodies in Leah Yerpe’s large-scale works are multiplied in different poses, twisting, floating and falling on a ground purged of contextualizing marks. The models are not posed and have free reign to move in an immediate, improvised dance. This looseness contrasts with a fastidious drawing technique, wherein the bodies are captured as if formal elements in a collage. Yerpe sees the figures as transformed from free individuals into symbolic ones, akin to the transformation of human experience in mythology and religion. The influence of mythology is often hinted at in the titles, though the work is not a direct illustration of the stories. Rather, the artist is after that kernel at the heart of the story, the core that will always resonate human experience.